Unitronics designs, manufactures, and markets quality PLCs for the global market. Easy to use, efficient, and affordable, our products have been automating processes, systems, and stand-alone applications since 1989. Unitronics’ field-proven PLCs automate hundreds of thousands of installations in diverse fields: petrochemical, automotive, food processing, plastic & textile, energy & environment, water & waste water management – anywhere automated processes are required. They offer UniStream (for high-end machines and automation projects); Vision (for advanced machines & automation projects); and Samba (for small machines). 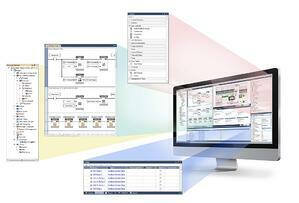 Powerful PLC with incredible HMI features and a built-in webserver. Completely modular and scalable hardware — backed by the most efficient programming software you have ever used. Execute high-end projects — on time and within budget. All-in-One programming environment. Slash your development time by 50%. Tailor UniStream™ to suit your precise application. 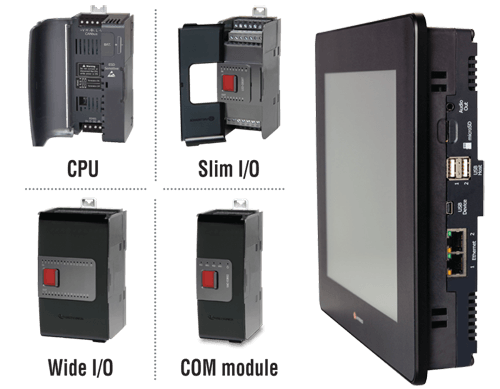 Select your HMI panel, snap on a CPU, and I/O to create a compact All-in-One controller. Powerful CPUs—faster scan time, up to 2048 I/Os, and over 2MB of operand memory. High-quality HMI touch panels + an easy-to-use HMI editor for elegant screen design. Sophisticated, space-saving I/O—effortless local and remote I/O installation. **Unistream comes in 7", 10.4" or 15.6" screens sizes. 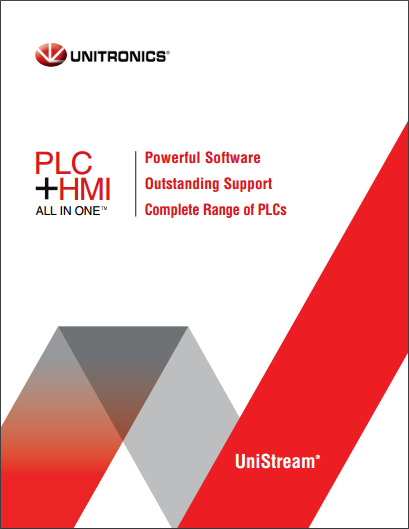 Unitronics’ recent launch of a new line,UniStream® Remote I/O, greatly expands the reach of UniStream, the award-winning PLC + HMI controller series. The new line comprises an Ethernet-based Remote I/O adapter and a broad range of Remote I/O modules, each offering a different configuration of analog and digital I/O. A single UniStream Remote I/O adapter can support up to 63 12mm-wide I/O modules. Each adapter comprises two Ethernet ports; this enables users to link an adapter to a controller, and then daisy-chain adapters to support up to 8 adapters per controller, enabling to increase the total number of I/Os supported by a single UniStream. I/O configuration is a snap; users simply drag & drop the selected module to add it to the hardware configuration in UniLogic, the All-in-One programming environment. UniStream Remote I/Os are a powerful addition to the UniStream series, which supports Industry 4.0 via features such as MQTT, VNC, FTP, Web Server, email and text messaging, and SQL Client. 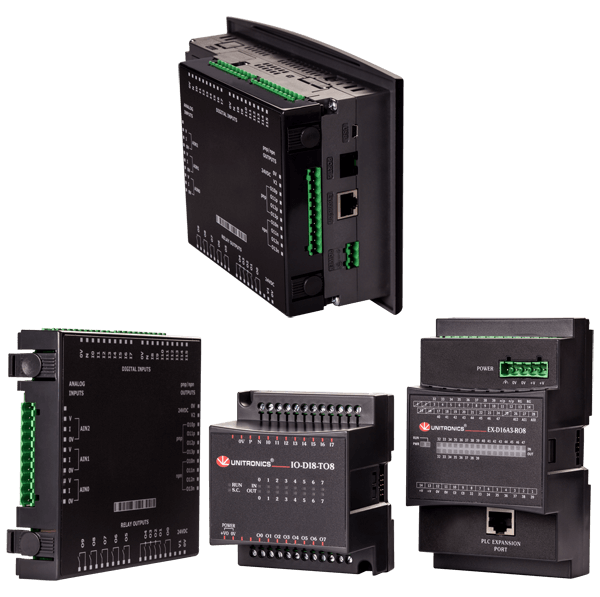 Other benefits include auto-tuned PID, data logging, data tables and Recipes, data sampling displayed via built-in Trends and Gauges, Alarms, multi-level passwords, Video + RTSP, and plug & play communications for CANopen, CAN Layer2, MODBUS, EtherNet/IP, and more. 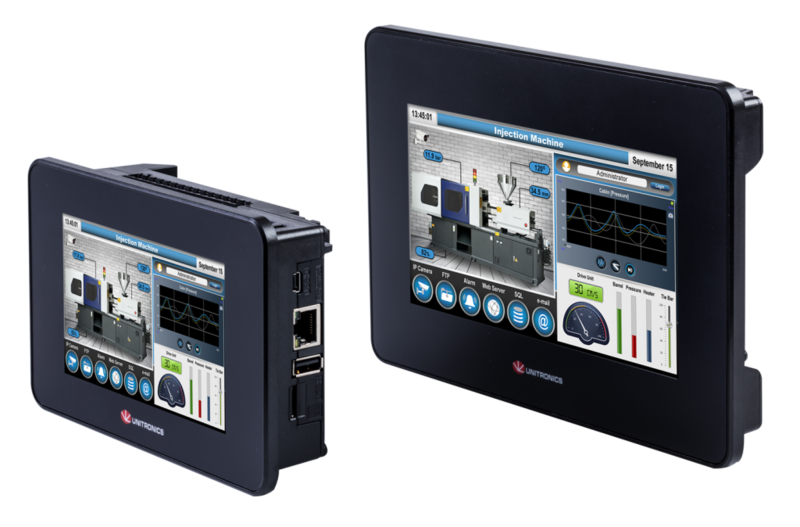 Unitronics’ new UniStream® 7″ Built-in All-in-One controller brings you the advanced communication capabilities you need for Industry 4, complete control functionality, and the ability to support the newly-released line of UniStream Remote I/O modules – over Ethernet. 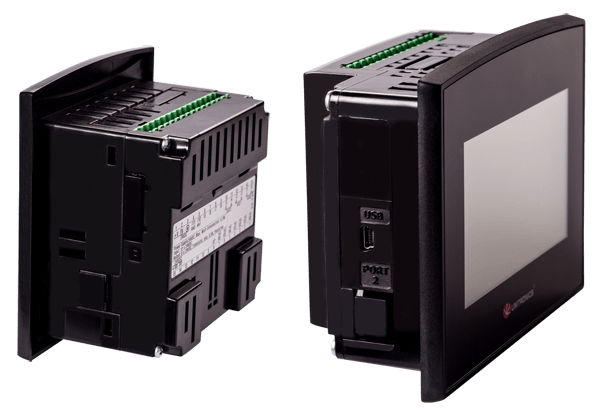 Highly compact, all-in-one controllers fill a niche in the programmable controller market—serving OEMs and system integrators who need space-saving controllers that deliver the functionality to control complex machines, while creating a competitive advantage via a color-touch HMI panel. An award-winning series of PLC + HMI controllers, ranging from palm-sized controllers with onboard I/O to large-screen controllers with snap-in I/O. Vision is a true workhorse: reliable, versatile, field-hardened – a cost-effective All-in-One controller. New – Remote Operator mobile app for the Vision™ and Samba™ series. Available from Apple’s App and Google Play stores. All-in-One programming environment. Simple and fast development for both Ladder and HMI applications. Vision offers a model to meet any advanced control project need. 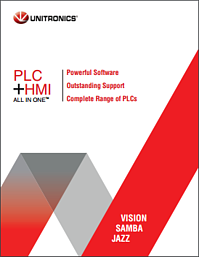 Palm-size Vision All-in-One controllers offer a broad range of built-in I/O configurations. Larger-screen Visions support a variety of I/O modules that snap onto the back of the controller to supply onboard I/O. All Vision controllers are expandable. I/O Expansion Modules can supply digital, relay, high-speed, thermocouple and load cell. **Vision screen sizes range from 2.4"- 12.1" and come in color or black and white. Boost the price/profit ratio with award-winning Samba—a perfect fit for any small machine or simple project that requires a true PLC controller and a high resolution HMI color touchscreen. Upgrade your low-end projects with an elegant HMI screen, without sacrificing PLC functionality. Samba™ offers a range of on-board I/O configurations. Offering a flat fascia, compliant with IP66/IP65/NEMA4X—Samba is an excellent fit for food & pharmaceutical applications. **Samba screen sizes are 3.5", 4.3" and 7". Interested in a Unitronics Product? Find all of Unitronics' videos on their YouTube Channel. Unitronics Application? Let us help!